Boris Johnson will answer questions from the London Assembly this Wednesday (17th March 2010) when he appears before it for this month’s Mayor’s Question Time. 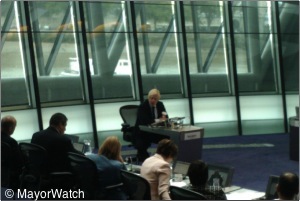 Other questions facing the Mayor include one from Green AM Jenny Jones asking whether he stands by an election promise “that only hotels and restaurants paying the London Living Wage would be promoted by Visit London ahead of the 2012 Olympic and Paralympic Games”. LibDem Dee Doocey is pursuing the issue of cuts to London’s policing budget and wants details of the cuts “Borough Commanders have to make in their Borough Devolved Budgets in order to meet the 5% cut they are required to make in each of the next 3 years”. Brian Coleman, Conservative AM and chair of London’s Fire Authority, is asking Boris to seek assurances from the Crown Estate that its sale of Cumberland Market won’t see any reduction in the level of affordable housing in his constituency. The meeting take place this Wednesday, 17th March, at 10am. Full details of the questions AMs will be asking Boris can be found on the london.gov.uk website. The Audit Panel will meet to discuss the Annual Governance Review and Ethical Governance Audit, together with internal and external audit reports.